* The difference between X and Y is your overhang. This difference should never be changed. If you change the X you MUST change Y by the same amount. All Mantel Shelves are available with a brick return. 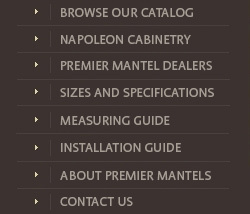 All mantels are available in custom sizes and as cabinet mantels.